" Forget the almost static nature of the baroque style, it is to characterisation and the music wedded to it which makes or breaks a work . It certainly makes it if, more than two centuries after they were written, some baroque operas still hold centre stage. 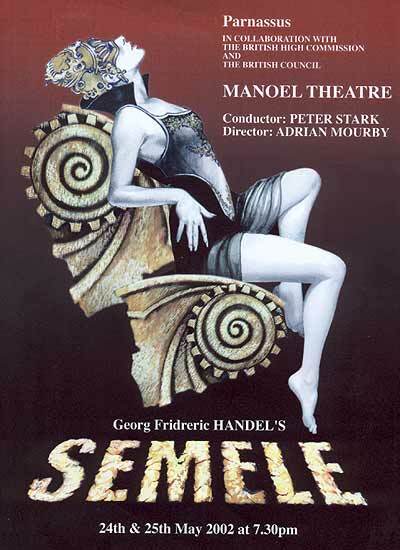 Semele still does. Such works should still allow for enough movement to keep the plot moving and flowing well. Adrian Mourby's production and involvement in direction ensured this ... the often stylised and very well synchronised antics of some characters or the more seriously effective of the others went down well with this writer." "Peter Stark conducted the score with a theatrical elan that balanced the staticity of stage... the production was static if elegant and impressive ... Nicky Kennedy gave a convincing performance of [Semele] as a voluptuous yielding coil of flesh who is at the same time possessive and demanding. Linda Hibberd's Juno was a fine portrait of a jealous woman .. her character kept developing right up to her final triumph over the death of Semele. The other lead, Jupiter, sung by John Upperton, was also an excellent singer whose singing richly portrayed the character of a god who... only wants to make love and in his eagerness makes some ungodly mistakes,. At the same time he was capable of deep feeling and in the end was rather shaken than frivolous"
"Jupiter was sung by John Upperton, who has a very good tenor voice at his disposal and can also convince as a actor. This is true also of Nicki Kennedy whose powerful, confident but not too flexible soprano and lively acting realised Semele's contrary character well. With her flexible, warm mezzo voice Catriona Barr performed Semele's sister Ino while the powerful but slightly harsh mezzo Linda Hiberd fitted Juno well but sounded quite exhausted in the deeper tones. Gillian Zammit excelled in the small role of Cupid with her literally beautiful soprano voice. Stephen Holloway performed his powerful baritone as Cadmus and Somnus, suitably to his roles, while Robert Ogden's Athamas and Apollo was interpreted with very special counter tenor timbre. In the small role of Iris Rebecca Bottone was a very active bonus."